Just what are the best fencing shoes? What are the best shoes for fencing? Do you need to purchase high-end fencing shoes, or can you go with a budget model? Updated for the 2018-2019 Fencing season. One of the most asked questions in the Fencing.Net forums seems to concern fencing shoes. 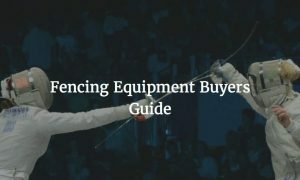 Just what are the best shoes for fencing and what type of shoes should you get, should the top-end fencing shoes be out of your budget range? First, keep in mind the dynamics of the sport. Fencing requires sudden changes of direction and the fencing lunge exerts a force of up to 7 times the fencers’ body-weight onto their leading heel. When asked, fencers say they want shoes that are low to the ground and give them a good “feel” for the strip. Fencers also demand lateral stability in their shoes to accommodate the changes of direction. Fencing has among the highest force applied to heel of lead foot in all sports. Up to 7x body weight. Close to the level of impact of a big man (like Shaq) after a dunk! The trailing foot takes a lot of damage. Traction: wood floors and gyms. Keep in mind that NACs and larger tournaments are held with fencing strips on top of a concrete floor with minimal padding. The following is a quick summary of the most popular fencing shoes on the market today. If you want more detail, continue reading to get a better feel for the full range of options out there! What type of fencing shoes should I get? Age and budget run hand in hand. Young kids are either going to destroy their shoes or outgrow them. You’ll have to look at the number of training hours and how hard they are on their fencing shoes to gauge which model is going to be the best value. The higher the level of competition, the better shoe you’ll want to buy – mainly for durability on metal strips and for better cushioning and traction at those national events. If you are purchasing fencing shoes for your child, keep in mind that you need to get the pair that are going to last, while also being the best for them and their training schedules. An 11 year old that trains 3 to 5 times per week and is traveling nationally is going to burn through the low end shoes, so they’ll need more than one pair per season. How long should fencing shoes last? Most shoes in other sports are targeted to last for a single competition season in that sport. It’s easy for seasonal sports like baseball for kids where you’ll be swapping out cleats each season as your kid’s feet grow. In fencing, there are overalapping seasons between the youth, junior, and senior ranks and many kids compete across age groups, which muddles the lines between seasons. The top brands are targeting shoes that have the internal cushioning lasting 9 to 12 months. For youth fencers with a moderate training schedule, the kids will outgrow even the basic shoes before wearing them out. Of course, some clubs have a more intense training schedule which will impact your shoe budget. Durability on the outsoles of fencing shoes is highly variable depending on the level of activity and the fencing conditions in the fencer’s club. A fencer who is training 2-3 hours 4 days per week plus local events and NACs will burn through a pair of shoes much faster than the fencer who trains 2 hours for 3 days per week and only goes to one tournament per month. A fencer who has the more active training schedule should shy away from the “beginner” shoes: the AF Elite and MVPs as those will wear out quickly with a lot of training hours. Opt for something on the higher end for more durability. Another thing to keep in mind with fencing shoes is that they are made in men’s sizes only. This creates issues for the women in the sport since you’ll have to do some conversions to get from a women’s foot/shoe size to pick out the appropriate men’s size. This is mainly due to the size of fencing as a sport. We’re hoping that fencing gets large enough to get manufacturers to design shoes specific for women. Until then, it’s up to you to do the appropriate size conversions. The best thing is to try on the shoes, or order a couple of pair in different sizes and then returning the ones that don’t fit. If possible, its generally a good idea to time buying your first pair of shoes with a tournament large enough for a fencing equipment vendor presence. This way, you can try on a few in person and pick up the pair you like best. Yes. Nike has a fencing shoe. This is the fencing shoe of choice at the FdN offices. The Nikes run at the top end of the fencing shoe price range and come in at $175. The shoes have a ton of research and design behind them and were launched with the 2008 Olympic Games. The retail version of these shoes is in a white/gray/black model with some colors that were made available to NCAA collegiate teams. The various other colorways are still available from some vendors, though availability is not consistent. 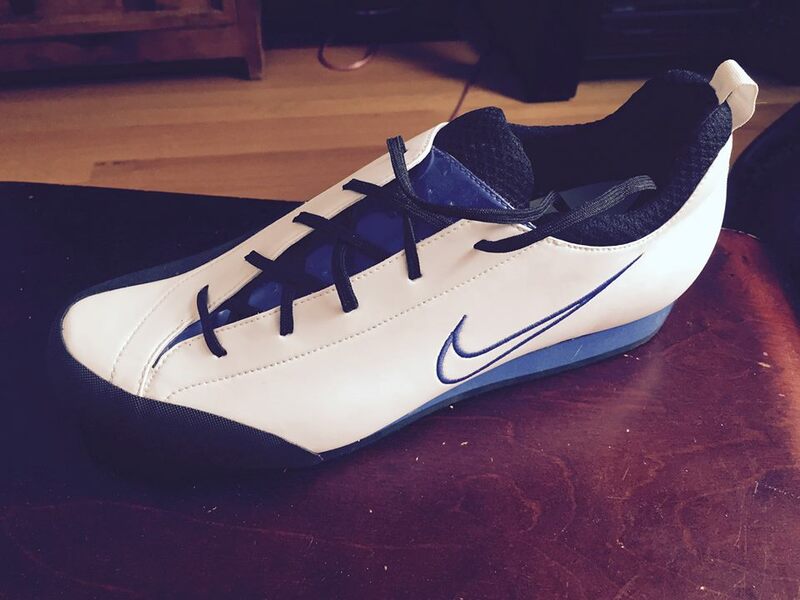 For more information, see our official Fencing.net Nike Fencing Shoe Review, which includes more details, pricing info and where you can currently buy these shoes. In terms of weight, the Nike shoes are currently tied with or slightly lighter than the most recent Adidas line of fencing shoe, the D’Artagnans. 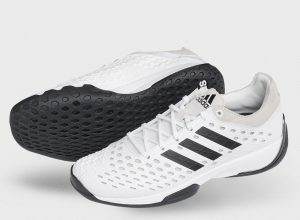 The Adidas Fencing Pro was launched in advance of the 2016 Olympic Games and was generally intended to be an answer to Nike’s cornerstone shoe. It features an abrasion-resistant exterior for durability, rounded medial zones for ease of lunging, and multidirectional grip for quick movement changes. Its available in black/white and salmon/white colorway options. The common consensus seems to be that they feel very much like a court shoe and could be used for other sports like badminton just as easily as fencing. For those who prefer court shoes, this is likely a great thing, as its a court shoe with fencing touches. For those who don’t, this shoe will likely not be worth the price due to the lack of other niceties that come with other shoes. 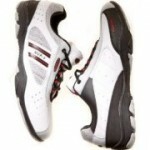 The D’Artagnan IV was launched in 2010 and is still Adidas’ most popular dedicated fencing shoe. The shoe looks like a bit of a Frankenstein. The back half is white and the forefoot is black. The inside edge of the shoe features the traditional leather layer (as opposed to the synthetic materials used by Nike) and Adidas has really worked on the weight of the shoe. 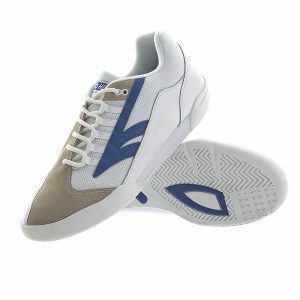 This shoe has been very popular, mainly due to the $115 – $125 price point in the market. Recently, Adidas released the D’Artagnan V, resulting in a price drop on the IV and reduced availability, but it is still generally out there for purchase. The D’Artagnan V was launched in early 2017 and replaced the IV version of the product line. Its still a little early to get a feel for the shoe’s durability, but it is generally viewed as an incremental improvement over the D’Artagnan IV. Comfort, durability and weight have all been slightly improved. The Razor is the latest model of fencing shoe from the Leon Paul/Hi-Tec joint venture and are only available for purchase from Leon Paul. They straddle the line between high end and budget fencing shoes, with a number of high end features with a $100 price tag. Notably, they are made primarily of moisture wicking material, have offset lacing to protect the laces from abrasion, and an extra heel cup for heel protection. These are the entry-level cheap fencing shoes. These are all under $100 and trying to get as close to the $50 price point as they can. The AF Elite 2017 is the third generation of the Elite line of fencing shoes from Absolute Fencing Gear. The NJ manufacturer offers this shoe all the way down to a size 3 to get into the kid’s market. 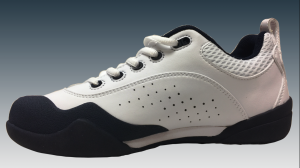 The shoes run on the narrow / small side, so those with wide feet may need to order a half size up. These are basic, value shoes that will certainly last longer on a strip than a non-fencing or street shoe. Those who are hard on shoes or train an intense schedule will likely eat these up faster than once per season. Blue Gauntlet is targeting the beginner and youth market with their MVP line of fencing shoes. There are three models ranging from $50 to $70 in price. In general, these are a reasonably good entry level shoe. They’re priced around the same as a non-fencing court shoe but provide the extra features that benefit fencing’s needs. They have good fencing-specific shock absorption and improved protection in common wear spots. The main downside is that they’re going to wear out faster than some of the more expensive options. What are the best non-fencing shoes for fencing? It’s tough when you have to shell out $120 – $175 every 9-12 months for new shoes. It’s worse when you’re one of those fencers who are notoriously hard on shoes. For that reason, many fencers have turned to their local sporting goods store to find a decent non-fencing shoe that meets the demands of fencing while still providing a good value. There are some types of shoes to look for and some to make sure to avoid. The most popular shoes to use have been court shoes. 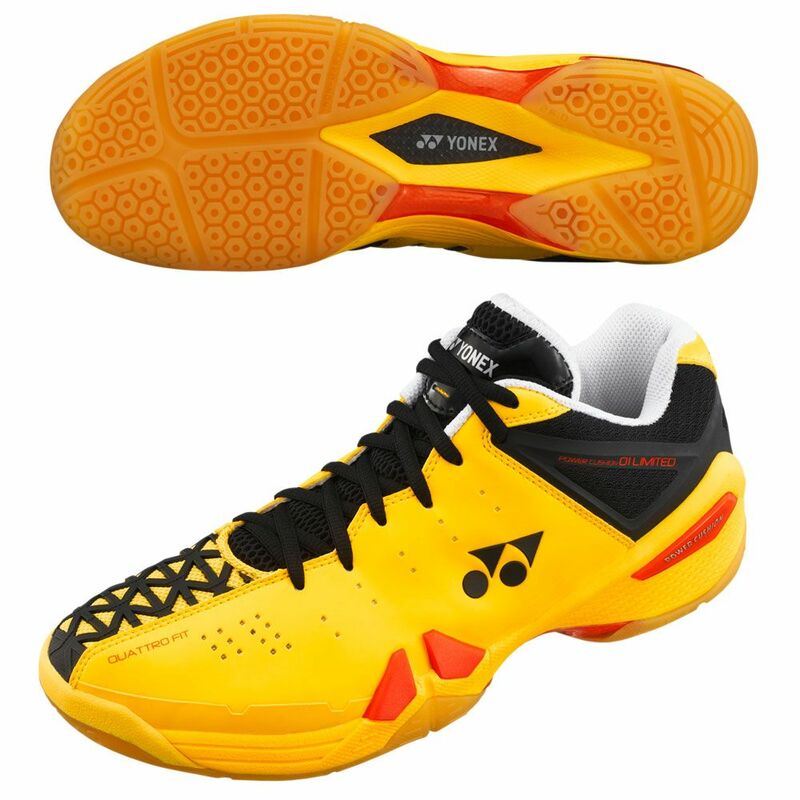 These are shoes made for sports like raquetball, squash, and even volleyball. Those sports feature lots of lateral motion and lunging actions. This means that they will be low to the ground and have cushioning set up for the heel strike (for your front foot) as well as the lateral stability for side to side motion (for your back foot). We had a fencer test this shoe out and she loved it. The gum soles are great for a wood floor fencing club and they held up reasonably well at NACs. The shoe was used for just about a full season of training and competition at the NACs and Junior Olympics before being retired in favor of the Nike Ballestras. The Asics make a decent shoe if you’re on a budget. 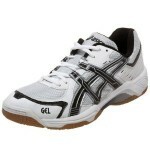 The Asics have been reported to work out fine as a fencing shoe, but their durability is suspect on rough metal strips. Older models have actually had the gel come out of the sole after extremely intense use on metal strips! They’re reported to be a bit heavier than other shoes in their class. Epee fencers in particular tend to prefer these shoes more than the other weapons. 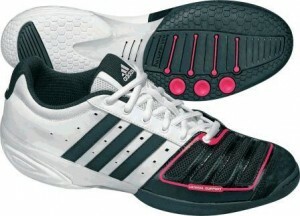 The Adidas Stabil series can be seen in many epee tournaments. The Stabil line has a number of models, many of which are simultaneously in production and widely available from many sports retailers and shoe stores. The Yonex Badmiton shoes are generally well-cushioned for the explosive moves you see on both the badminton court and fencing strip. They have grippy soles. They have great lateral support and sufficient toe protection. They’re reported to be a pretty good shoe if you can find them. Luckily, Amazon has started to carry them as of late (they used to be much tougher to get your hands on). Not many people are using these, but those who do pick up a pair are reporting good results. If you do decide to grab a pair for yourself, report back on your experiences on the Fencing.net Forums! Any “fencing” shoe made by a major fashion designer. There are “fencing” shoes out there by some major designers. When you take a look at them, they resemble fencing shoes and that’s because they are fashion (read: walking about town) shoes that were inspired by the sport of fencing. There is absolutely nothing in the shoe designed to hold up to athletic performance or usage. Wear them out on the town, but take them off in the fencing club. Friends don’t let friends fence in wrestling shoes. Some misguided souls take a look at wrestling shoes and say “hey, that’s *really* low to the ground, I’ll really feel the strip in those” and they get them. A couple of weeks later they’re complaining about foot, knee, and lower back pain. 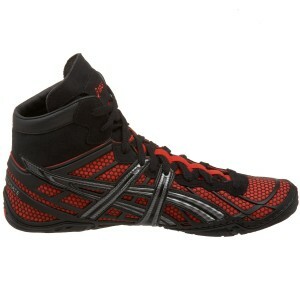 Wrestling shoes are made to be used when competing on a 2 inch thick mat. Nothing about that says “durability on a strip” or “heel cushioning for a lunge.” Avoid wrestling shoes at all cost. If you see someone at your fencing club suited up to fence and wearing wrestling shoes, put them in a 3/4 nelson, pin them to the floor, and make them go put on something suitable. Hard heel cup. The hard heel cup is a hard plastic heel insert. Use these for your front foot. What the hard heel cup does is keeps your heel from flattening out during the lunge, allowing your heel’s fat pad to do more work in cushioning the blow of the lunge. The Nike shoes have a hard heel cup integrated into the design, but if you have a tendency to get a bruised heel, go ahead and get one. They’re about $5.00 from most fencing equipment retailers. Avoid the soft gel heel cups. They raise the height of your heel in the shoe, plus the grip on your sock, which means you’re a lot more likely to put holes in your socks while fencing. Cushion insoles. On lower end shoes like the AF and Blue Gauntlet house brands, spending another $15 to $20 on cushion insole will make you feel a lot better towards the end of the day during your fencing tournaments. Check out the SoftSol inserts and get the one that has a good heel strike and protection for the ball of the foot. They make several models matching up with different foot-impact styles.